Hard to believe it's only been three years since A Cold Season launched Alison Littlewood into modern horror's hallowed halls, given the indelible impression she's made to date. Her debut, selected as it was for the Richard and Judy Book Club, was widely-read and basically beloved; the British Fantasy Society deemed Path of Needles one of the best novels of the year of its release; and The Unquiet House was shortlisted for a Shirley Jackson, which award Littlewood just won for her contribution to the inaugural Spectral Book of Horror Stories. Long story short, this lady's going places. But first, because her fans demanded it, I gather, A Cold Silence ushers us back to Darnshaw—in the company of the central characters who visited that village of vacuum black and icy white in A Cold Season, even—for a deal with the devil that did next to nothing for me, I'm afraid. 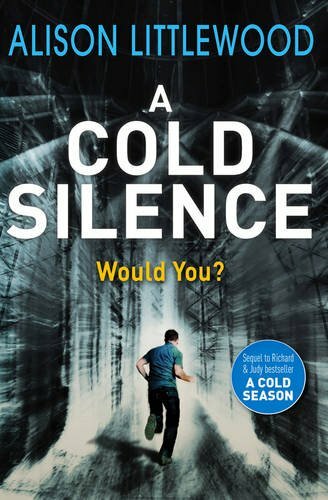 A Cold Silence kicks off a decade and change later: single mother Cass may have escaped the clutches of a cult with the darkest of designs on her little boy, Ben, but the years have been anything but easy on the Cassidy family. Mum has struggled to reconcile the hellish events she went through then with the life she's lived since, not least because her girl, Gaila, is a constant reminder of that terrible time. Least, she was until recently, when Gaila left for London to make some money modelling. Wasn't so long ago that Ben went his own way as well, working for the developer of a very successful video game called Acheron—more on which in a minute—in the aforementioned capital. He's had to come home, however, because of Cass' condition. Ben's "given up everything; left his job and his life in London," (p.37) and that sacrifice has been the source of great frustration, for him. When a family friend from Darnshaw dies, he's far from surprised that Cass refuses to go to the funeral, but when she tries to tell Ben he can't attend, enough, he finally decides, is enough. He goes to the service in secret. There, he bumps into a few familiar faces he can't quite place, who tell Ben that Acheron is responsible for Jessica's death. Apparently, Acheron "promises fame, fortune, and even love... whatever the heart desires. And the cost of playing?" (pp.91-92) Only your immortal soul! Like most people, Ben has never taken this statement seriously, but Jessica evidently did, and she's just the latest in a spate of suicides linked to the game of her generation. Inevitably, then, Ben and his former friends—as well as his little sister—sneak into the Acheron offices late one Friday night, supposedly to set the developers back a bit by sabotaging their servers. But there's someone waiting for them there: someone who knows exactly who they are; someone in a position to reveal their deepest secrets; and someone with a certain interest in the Cassidy family. That statement is as fitting a criticism of this at times tedious sequel as it is its cartoonish antagonist. Everything you need for a good horror novel is here, but precious little of it is convincing. The plot is promising, particularly the parts that piggyback on A Cold Season's powerful premise, but it's hard to take heart in what might have been when what we're left with is two hundred pages of repetitive talking heads. To make matters worse, A Cold Silence's central character can't hold a candle to Cass—where she was guided equally by her grief and her hunger for something more than misery, making her an exquisitely conflicted figure, Ben is an easily-led lad with all the personality of a pencil. His only redeeming feature is his relationship with his sister, but Littlewood leans so heavily on this that it feels false far in advance of the finale. It may be hard to believe that it's only been three years since A Cold Season made Alison Littlewood a household name in the horror genre, but it's still more difficult, I think, to square this step backwards with the forward momentum she'd gained to date. This book screamed "bad idea" just from the synopsis.